There are one baby tooth keepsake for boys and one for girls. The weight is about 6 ounces each. The size is 4.8"*4.9"*1.2" each. After your child turn 5, they will start to lose their baby teeth; Make sure you ask the dentist to get the teeth back; Boil teeth for at least 5 minutes to clean the teeth; After air dry, put teeth in corresponding holes of the baby teeth keepsake box. 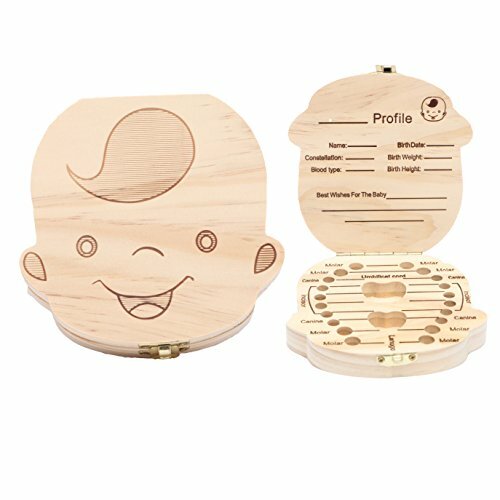 GO GREEN:This baby tooth keepsake box is made of all natural wood, environmentally-friendly. It is durable and sustainable for years. UNIQUE PROFILE:There is a unique profile on the roof of the box cover,boy/girl, which can keep the children's unique profile, which including the child's name, birth date, constellation, etc. KEEP MEMORY:Both the unique profile and the teeth organizing holes are memory keepers for each child. It will remind the family all those special touching moments, It also a reminder to the child that we need take good care of our teeth when we see activities on out teeth. PEFECT PRESENT/GIFT:This baby tooth keepsake box can be a perfect present/gift for Christmas/X-mas, New year, birthday, baby shower and etc.